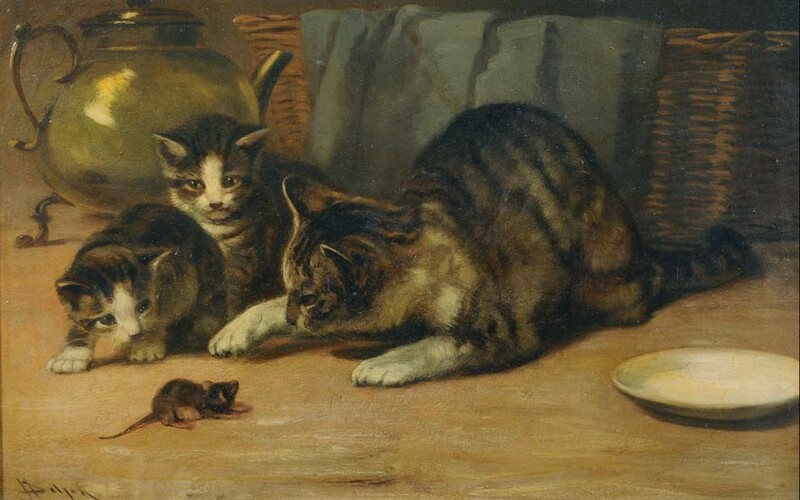 Playing Cat and Mouse by John Henry Dolph (1835-1903). In the early 19th century, at the Earl of Lucan’s residence at Laleham, there was a very singular cat. She belonged to Lord Lucan’s bailiff, Mr. Smith, and had the “constant habit” of curling up on the rug before the parlor fire. According to a story related in multiple 19th century British newspapers, as well as in author Edward Jesse’s 1834 book, Gleanings in Natural History, after the death of her recent litter of kittens, this particular cat struck up a very close friendship with a mouse.